Please visit website at: http://mshp.org.hk/?page_id=5666/ for detail information. Please visit website at: http://www.hksccm.org/ for detail information. Please visit website at: http://www.efccna.org/education/efccna-congress/ for detail information. 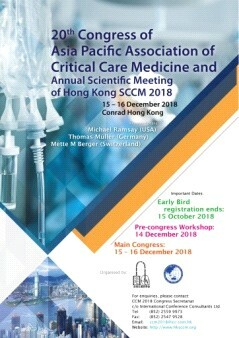 The sponsorship offered by the Hong Kong Association of Critical Care Nurses (HKACCN) is to provide partial funding to life and full members of the association for attending critical care conferences/Symposiums. Through the sponsorship, the association hopes to support its members in self-development and self-enrichment, thus enabling the professional advancement of critical care nursing in Hong Kong. 1.1 Only life or full members of the HKACCN will be considered. 1.2 Applicants should not receive dual benefits for the same Conference/Symposium, i.e. should not have been sponsored by another Institution for the same conference/Symposium. 1.3 Applicants would not be eligible if sponsorship for another Conference/Symposium has already been granted by the HKACCN in the same calendar year. Information regarding recommended conferences could be found in HKACCN Newsletter. Eligible personnel can contact the clerk of HKACCN for the form and submit to HKACCN for consideration. Usually one to three members will be offered sponsorship for each conference/Symposium. The HKACCN reserves all the rights in the selection of candidates. Applicants will be informed of the result individually. The president and PDC Chair or their delegates would be sponsored. 4. Post conference commitment The sponsored member(s) is (are) expected to promote functions related to professional development of HKACCN and to participate in the yearly experience sharing session(s) which we offer to our members free in charge.